Aquesta joiera se sent especialment atreta per les nombroses funcions de la mà i bona part de les seves joies conviden a dues o més persones a interactuar amb elles. Metal inclinations, Contemporary Craft i Crafthaus. This jeweler is attracted by the numerous functions of the hand. 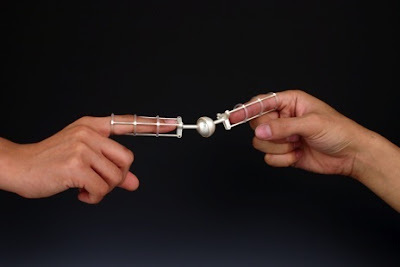 Part of her jewelry invites two or more people to interact with it. Metal inclinations, Contemporary Craft and Crafthaus. This entry was posted by Montserrat Lacomba at 1:16 pm. | This post has no responses. This post is filed under Blog, USA and tagged with contemporary jewelry, Sun Kyoung Kim.